Las Vegas is a sparkling gem in the heart of the Nevada desert. While known for flashy casinos and lively libations dotting the ever-so-famous Strip, there’s more to the city than that. Vegas has roller coasters perched atop buildings, indoor skydiving facilities and even hidden waterfalls — an oasis in the middle of the desert — open for free to the public. 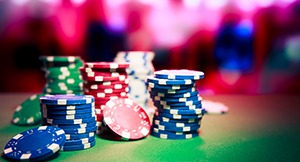 Explore our Las Vegas vacation packages now to see if Lady Luck is on your side. 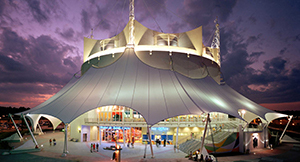 While residencies change, some well-known shows have been gracing the Las Vegas Strip for a long time now, including Cirque du Soleil and a variety of magic shows. Vegas currently has eight amazing Cirque du Soleil shows including the aquatic acrobatics of “O” and Criss Angel’s “Mindfreak,” featuring acts made famous on his show combined with new illusions for a magical experience. Celebrities and famous musicians including Britney Spears and Celine Dion have previously held concerts in the casinos, but future dates, times and appearances change. You can visit Vegas.com for information on upcoming performances. Explore the serene oasis that is the Palazzo Waterfall Atrium and Gardens. 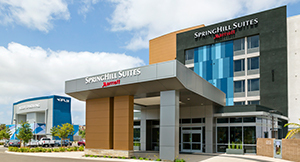 The multi-story attraction features a waterfall, domed skylight and exotic flowers sure to impress. Best of all, it’s open 24 hours a day, so you don’t need to make reservations — AND it’s free! 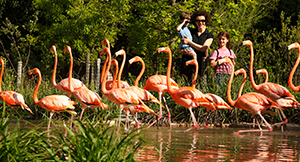 Another free exhibit is the Wildlife Habitat at The Flamingo, home to a variety of birds including pheasants, ducks, swans and, of course, flamingos. The exhibit features winding walkways alongside streams and waterfalls, bridges over lagoons full of koi fish, and tall trees to shade you from the hot Nevada sun. Be sure to charge your camera before this adventure. Take a leap — indoors! Dangling hundreds of feet above the earth may not be everyone’s cup of tea, so quench your thirst for adventure at Vegas Indoor Skydiving. Located just off of the Las Vegas Strip, this facility will provide you with a brief training class, then you’ll be fitted with flight gear and soar upward inside a padded room with a fan that generates wind speeds of up to 120 mph. This one is pretty much a given, but since Las Vegas is known for its casinos, we wanted to be sure to mention it. Each casino on the Strip — including The Venetian, MGM Grand, Mandalay Bay, Bellagio, Caesars Palace and so many more — offers 24-hour fun for adults 21 years and older. There’s nothing quite like the adrenaline rush of table games, slots and poker at the casinos in Vegas. While Vegas is known as a playground for adults, there are several activities the kids can participate in, too. Located in the heart of the Strip is the High Roller, the world’s largest Ferris wheel that features 28 transparent pods that can hold 40 adults each. Visit The LINQ Promenade for a ride high above. For even more stunning views of the Strip, walk over to New York New York Hotel & Casino and enjoy towering drops and loop-de-loops galore from the second-floor roller coaster, The Big Apple Coaster. If you’re up for it, you can even get married mid-ride! 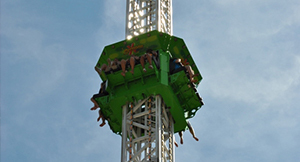 For an extreme thrill 866 feet above the ground, ride the outdoor X-Scream, perched on the top of the Stratosphere. Las Vegas is a top U.S. destination for travelers, with more than 41 million people visiting the city each year. Vegas Vic, the iconic neon cowboy that towers over Fremont street, is the world’s largest neon sign. With over 150,000 hotel rooms in the city, 17 of the 20 largest hotels in the world are in Las Vegas. The Stratosphere is the tallest observation tower in the United States, standing at 1,159 feet tall. Talk to a Las Vegas resident and they’ll tell you that there are two seasons here: summer and winter. It’s the desert after all, so summer days can get very hot – 100 degrees-plus (Fahrenheit) from Memorial Day in May through Labor Day in early-September. Summer nights do not cool off much, so stay hydrated as you enjoy the many Vegas attractions. On the flipside, winter in Vegas usually means sunny skies and much-cooler temperatures, with daytime highs reaching the 50s and 60s (Fahrenheit) and lows near freezing.